All your customized alerts will appear in the Alerts tab with a status of Active. From here, you can edit the alert by double-clicking in its row. On the right side of the panel are the distribution lists you defined. If desired, you can show or hide additional data about the alert messages. Click a column header to open the drop-down menu, then click in the checkboxes to select the columns to add or remove. The columns provide the data described in the following table. 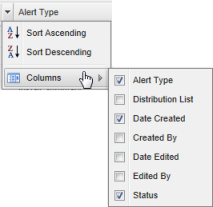 Alert Name The name defined in the Create Alert wizard. This column is static and cannot be hidden. Alert Type One of the alert types: Infection Detected, Endpoint Installed, Infection Summary, Install Summary. Distribution List The email recipients for this alert. Date Created The date the alert message was defined. Created By The administrator who created the alert message. Date Edited The date (if any) that the alert message was modified. Edited By The administrator who modified the alert message (if applicable). Status The alert status, which is either Active or Suspended.